I am so excited about today’s acts of kindness for kids idea! Not only is it fantastic, it is also from one of my very dear, real-life friends, Courtney. She was at the soccer practice with her boys last week and came across some plastic Easter eggs with kindness messages inside! The eggs made their day and they decided to pay it forward and make some kindness eggs for others to find too! After spreading Eggs of Kindness throughout with her kids in her community she also agreed to do an Acts of Kindness for Kids Hangout with me on Google Plus! Check out the video–we had so much fun chatting about how to use something as simple as a plastic egg to teach our kids about spreading kindness to others! My kids have been obsessed with leaving Happy Notes for people so, of course, they loved the idea of hiding eggs filled with kindness messages all of town. 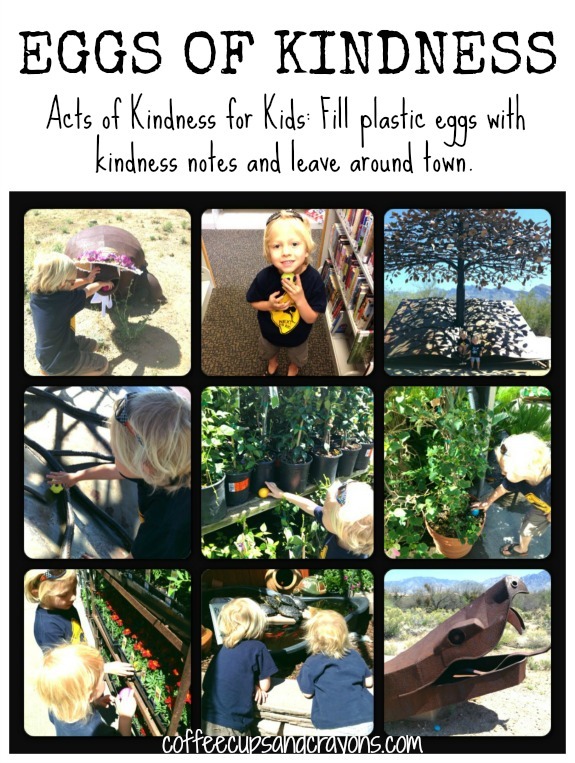 We can’t wait to use some of our leftover plastic eggs for acts of kindness this week! What a great idea! Some friends snuck into our yard on Friday and set up a surprise egg hunt for my kids. They loved that! That is AWESOME!!! I bet they were thrilled! What great friends! You guys are so kind and clever! Love this idea and also the fact they are easy to make and give. Home run! Awwww! Thanks Julie!!! It’s a great idea and I too love how easy it is! I love this. I love all of the Kindness ideas you share. Thanks Jen! I am always inspired by your ideas too!!! Love this! My boys will get into this as well! Thank for the idea! Thanks Sheila! I love your blog and have been pinning a ton from it! Yay! This idea just makes my heart smile. What a simple and fun way to practice kindness. Can’t wait to share with my little guys. Another great idea! Mason will love this just like she did the Christmas Random acts of kindness! Hope you guys have a great Easter. Oh what a lovely idea! I love things like this that teach little ones about the importance of kindness. This is a really cute idea. We keep easter eggs of hand for crafts anyways. I have included this in my Spring Acts of Kindness post. Thanks for sharing!